The annual survey also reveals the importance of service for counsellors and the link to employability as a key motivating factor for students wishing to study overseas. 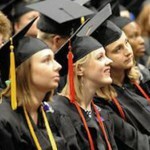 Recruitment agencies based in China and South Asia are particularly bullish about demand for study in the United States. 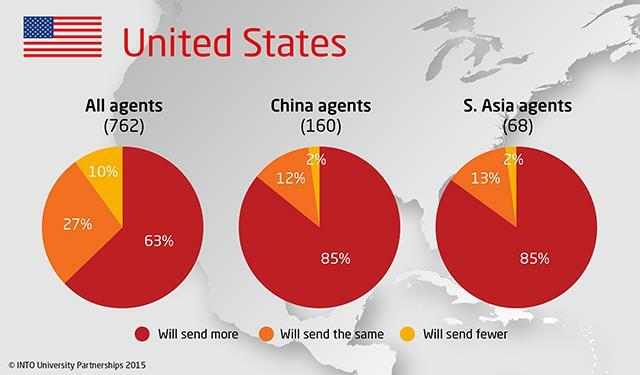 Chart One:In the coming year, do you think you will send more, the same or fewer students to the following destinations? Recruitment counsellors in China and South Asia (India, Sri Lanka, Pakistan and Bangladesh) are especially enthusiastic about the United States, which is good news for universities and colleges which are seeking to build their international enrolments from these regions. We also separated out respondents based on their role within the organization to see whether there was any difference in sentiment between those who are managers and directors and those who have a direct counselling role. What emerged is that managers and directors are marginally more confident about increasing numbers coming to the United States and Canada and marginally less so about the United Kingdom. What is the key to a good relationship? As with previous surveys conducted by INTO, the key to securing a strong relationship with recruitment counsellors lies more in the quality of service provided and choice of degrees rather than relying on the ranking of the institution to do the work. Rankings, of course, are important, and especially so for agents based in China, where 66 per cent have indicated it is very important compared to 53 per cent of the global sample. 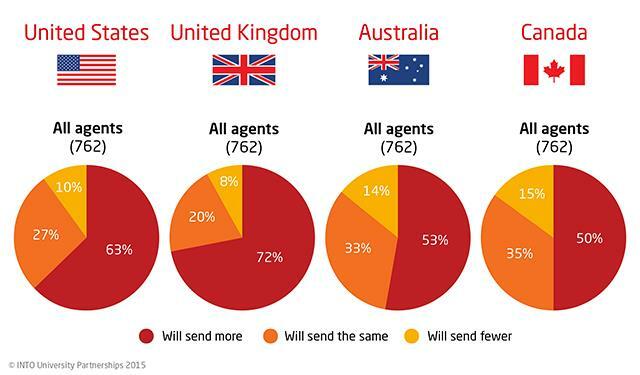 Response times to enquiries and applications, an area many institutions often struggle with, is cited as the most important factor for agents around the world. Being there is also a theme which emerges. Almost 50 per cent of respondents identified the ability to engage with staff based in their home country as being very important. Universities and institutions partnering with INTO can take advantage of a global network of 130 staff based permanently in the key source markets for international students. This ensures that partner universities are visible and accessible, but also provide the comfort and security of oversight and quality assurance. Student feedback is increasingly important to counselling organizations wherever they are based in the world. Social media is ubiquitous and student feedback is immediate and can be profound. Over the five years we have run this survey, we have seen the importance of good student feedback growing in importance for recruitment counsellors. 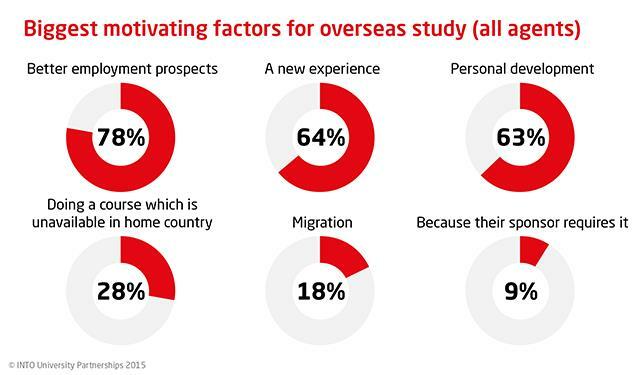 Across the entire network of respondents, studying overseas to enhance employment prospects is consistently identified as the most important motivating factor for students. This should not, however, be confused with an ambition to seek migration opportunities. The sample as a whole suggested that 18 per cent of agencies believe migration is an important factor. This figure drops to 11 per cent when looking at Chinese responses only. And of course this is not inconsistent with a broader, global perspective. There is evidence that for many European and American students studying overseas, the opportunity it offers to burnish their CVs and stand out for prospective employers is increasingly important. But for many, study abroad has a profound personal impact. This opportunity to spread one’s wings and gain new experiences is increasingly important to new generations of Chinese students studying overseas. 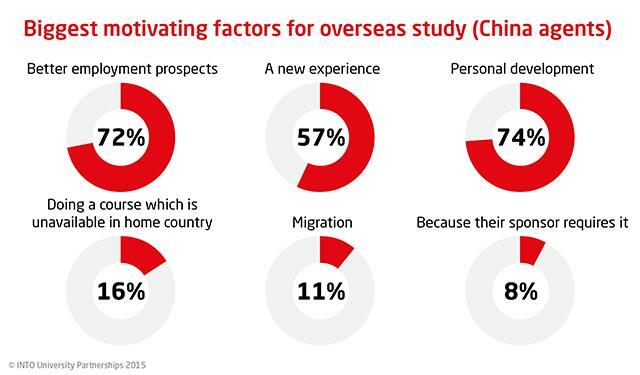 As our graphic illustrates, the majority of agents based in China believe that of all the factors which motivate students to study overseas, the opportunity to develop personally is the factor most often cited by agents as they counsel their students. So what does this survey reveal about the international education market and the role of agents in the process? Firstly, this survey seems to validate wider trends reported elsewhere on the continued growth in demand for high quality education. It indicates that growth in numbers of younger students and the attractiveness of the traditional destination markets remain undimmed. It is also reassuring (although the survey was conducted prior to SELT changes in the UK) that the UK remains an attractive destination for international students. Finally, however a student chooses to engage with the university, whether mediated through independent counsellors or direct, the wider student experience is more important than ever. With a world of choice, developing programmes which clearly enhance employability either directly or through the way in which the program is delivered – as with the University of Exeter in the UK is critical to continuing to attract students form around the world. And finally, as if any of us working in international higher education ever need reminding, the opportunity to study overseas is a life changing experience for students and it is a privilege for institutions to be able to welcome and support them. We must always remember that behind the statistics lies the need to cater to students’ wider development needs – and that this ought to sit at the heart of everything we do.